Building with bales of straw has become almost mainstream in some parts of the country, especially in the Southwestern United States. Many localities have specific codes for strawbale construction, and some banks are willing to lend on this technique. Straw is a renewable resource that acts as excellent insulation and is fairly easy to build with. Care must be taken to assure that the straw is kept dry, or it will eventually rot. For this reason it is generally best to allow a strawbale wall to remain breathable; any moisture barrier will invite condensation to collect and undermine the structure. Other possible concerns with strawbale walls are infestation of rodents or insects, so the skin on the straw should resist these critters. There are two major categories of building with strawbales: load-bearing and non-load bearing. A post and beam framework that supports the basic structure of the building, with the bales of straw used as infill, is the most common non-load bearing approach. This is also the only way that many building authorities will allow. 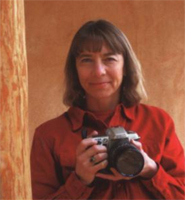 While there are many load- bearing strawbale buildings that are standing just fine, care must be taken to consider the possible settling of the strawbales as the weight of the roof, etc. compresses them. Erecting bale walls can go amazingly quickly, and does not take a lot of skill, but then the rest of the creation of the building is similar to any other wood framed house. In fact strawbale houses typically only save about 15% of the wood used in a conventionally framed house. 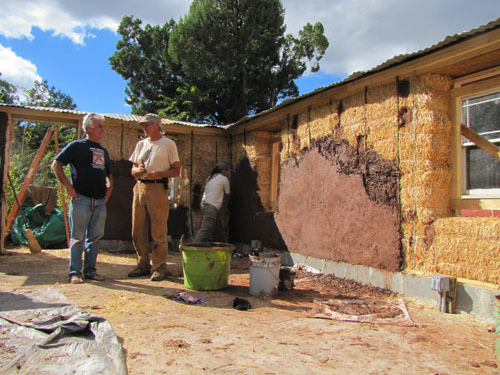 The cost of finishing a strawbale house can often exceed that of standard construction, because of the specialized work that goes into plastering both sides of the walls. The result is often worth it though, because of the superior insulation and wall depth that is achieved. * Innovative Tips and Techniques on all phases of wall building from design to finish. * Details on the latest straw bale engineering, window flashing, electrical wiring, and much more. 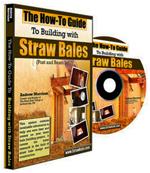 * Comprehensive explanation of how to actually build a straw bale structure from foundation to final baling. *A complete list of recommended tools for each stage of the baling project.